on protecting Columbia River salmon runs. What's a judge to do but listen, instead, to the science? Given all the scientific opinion to the contrary -- everyone but NOAA thought that stopping spill was a bad idea -- their chance of convincing the court seemed slim. When last seen, the BiOp would have made this year's proposed spring fish operation plan the new norm: federal agencies could spill or not spill at their own discretion. The fish operation plan was basically an effor to jump the gun. Needless to say, young salmon of all species -- except landlocked kokanee -- make their way downstream to salt water. They don't really swim down. The current sweeps them from the spawning streams to the sea -- unless, that is, the river has been dammed. Then, downstream passage can be a problem. The old river, the river that cut its way through the basalt of the Columbia Gorge, is basically gone. All the salmon populations in the Columbia River and its tributaries evolved in (or were intelligently designed for; this doesn't require Darwin) that river. They do best when the system functions naturally, or as close to naturally as generations of dam-building permit. Therefore, the question is how you manipulate the flows through reservoirs, through and over dams to replicate the conditions to which wild fish adapted. Beyond the obvious -- screening turbine intakes so young fish aren't sliced into sashimi, minimizing exposure to slack-water predators, so they're not swallowed whole -- this is largely a question of moving them downstream quickly enough so they're not saltwater fish trying to survive in a freshwater environment.. 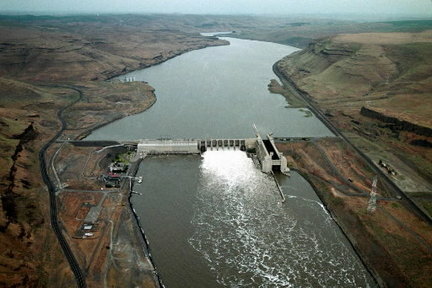 Starting in 2006, plaintiffs in the BiOp litigation have persuaded Redden to order spill at lower Snake River dams every spring. Arguably -- the plaintiffs certainly argue this way -- these spills have been at least partly responsible for the recent increase in salmon returns. The Fish Passage Center has compared salmon survival rates for the low water years of 2005 and 2007 -- before and after the court started ordering spill -- and has found that fish did better in 2007. Two years ago, Redden told the lawyers in the case, "I conclude the status quo [regarding spring spill operations] should be maintained" while the feds completed the 2008 BiOp. This year, the feds asked the judge to change his mind. What was new? Had anything changed, or was the feds' spring operation plan a classic example of people doing the same thing repeatedly and expecting a different result? Yes and no. What hadn't changed (what may never change) was that the usual suspects advocated the usual courses of action. What had changed was that they had acquired some new scientific data and therefore offered some new rationales. The federal agencies argued that in low-water years, steelhead do better when they're barged. But steelhead aren't the only fish around. Even if barging does help steelhead, the Fish Passage Center has pointed out, the feds' proposal would also "increase the proportion of yearling spring/summer Chinook, fall Chinook, coho and sockeye transported. The available data indicates that transportation may be detrimental to sockeye and does not show a benefit for spring/summer Chinook yearlings or fall Chinook juveniles." As Earthjustice lawyer Steve Mashuda points out, sockeye are the most critically endangered fish in the whole Columbia/Snake River system. They were the first listed under the Endangered Species Act in 1991. They are the symbolic red fish that had almost disappeared from Idaho's Redfish Lake. Besides, the Fish Passage Center noted that barged steelhead tend to screw up more. In the real world, even fish make mistakes. Salmon heading upstream to spawn sometimes stray into rivers and streams where they don't belong. If a stream still has a wild population, strays can dilute the gene pool. Steelhead that have been barged downstream stray a lot more frequently than those that have not. All in all, the Center observed that found that "spill increases reach survival, decreases travel time and increases (the smolt-to-adult ratio, which is basically the proportion of young fish that comes back to spawn)." The Center concluded that the NOAA analysis "does not provide convincing support for the BiOp to change juvenile fish passage operations." And the Fish Passage Center wasn't alone in taking a dim view of the federal agencies' science. A February report from the Western Division of the American Fisheries Society had already cast doubt on the data supporting and the objectivity of the federal government's arguments for more barging. It had taken a more general swipe at the underpinnings of the Adaptive Management Implementation Plan that the Obama Administration had appended to the Bush BiOp. This is significant. Eliminating spill in a low-water year would seem to have been the first stab at "adaptive management." The adaptive management plan made much of using the "best available science." The Fisheries Society scientists weren't buying it. "Rather than use a precautionary principle to protect threatened and endangered salmon and steelhead," they wrote, "the (adaptive management plan) seems to use a precautionary principle to support the 2008 Biological Opinion and to defend the status quo." Despite "repeated use of the term 'best scientific information,' " they wrote, their own group came to the conclusion that that the (adaptive management plan) does not always use the "best scientific information." A week later, the Independent Scientific Advisory Board, which reviews questions about fish for the Northwest Power and Conservation Council, expressed its own doubts about shutting off spill. Instead, the ISAB recommended viewing spill as the baseline, explaining that "spill more closely mimics natural situations and ecological processes than maximum transportation leads to a mixed strategy of concurrent spill and transport to conserve diversity and future potential of the ecosystem." This wasn't a new idea. The group quoted its own report from 2008: "Finally, the perspective on spill included in ISAB Report 1999-4 deserves special recommendation in this report: 'Spill: The general principle is that all juvenile passage alternatives should be evaluated against the baseline of spill. As an avenue of hydroelectric project passage, spill more closely mimics natural situations and ecological processes than other available routes. Spill . . . should be considered the default recommendation rather than simply one of the alternatives.' "
The ISAB report seemed to drive a stake through the heart of the feds' proposal. But the issue has''t disappeared. It may be revived in a matter of weeks, when the BiOp reappears. And getting fish down the Snake River will be an issue as long as the dams remain. In fact, as climate change becomes more of a factor, getting Snake River salmon downstream becomes more of a priority. As temperatures rise, some low-altitude or low-latitude spawning streams may become too warm for the fish. Columbia Basin salmon can't reach higher latitudes unless someone dynamites Grand Coulee. That leaves higher altitude, which the wilderness areas of central Idaho can provide. To some people, that makes breaching the lower Snake River dams an attractive idea. If the dams are ever breached, the debate over spill will become moot. Water will flow freely down the lower Snake. If the courts accept the Bush/Obama BiOp in something like its last public form, the debate over spill may also become legally moot: the feds will be free to spill or not, as they choose. Of course, they argued this time around that spill would be an adaptation to low flow in the river. "Provided that we have an average to above-average water year," they told the court, "... spring operations will be, in all material respects, the same as last year. Unfortunately, however, it appears this will be a below-average water year." Unfortunately, it does. But if the climate really does change, low flow will be the new baseline. In fact, it may already be. Jim Ruff, the Northwest Power and Conservation Council's manager for mainstem fish passage and river operations, said recently that flows in "11 of the past 12 years have been below average." "'It's a question of money; it's not a question of adequacy,' " Fazio said. Less surplus hydropower will be available for sale in the wholesale power market, and so the revenue from those power sales would be lower than in a normal year. As well, less hydropower will be available to back up wind power, which is highly variable. "The Bonneville Power Administration, which markets power generated at 31 federal dams in the Northwest, depends on revenue from surplus power sales to balance its budget. But already this year BPA has been using reserves to make up for lower-than-expected surplus power revenues." Did that have anything to do with the federal agencies' proposal to forego spill this spring? At the very least, it's an interesting coincidence. The agencies themselves discreetly avoided the subject. In both making and retracting their proposal to stop spill, they talked only about science and fish -- and their own willingness to adapt. Presumably looking forward to the unveiling of a new, improved BiOp, they "urge(d) the Court to consider the agencies' decision-making process on this issue and their actions. It is precisely this kind of informed assessment and modification of operations through adaptive management that exemplifies this administration's approach to implementing the 2008" biological opinion. That sounds a lot like "trust us." If only they can find a judge who has just fallen off the salmon barge, maybe he will.